Nuair a bha mi nam bhalach òg, bha mapa agam den lìonra rèile agus bha ùidh daonnan agam anns na h-ainmean-àite anns a’ Chuimrigh, gu sònraiche Machynlleth agus Pwllheli agus na rathaidean-iarainn ann an taobh tuath na dùthcha. Bha coltas cho iongantach is neo-àbhaisteach orra agus bha mi riamh ag iarraidh a dhol ann. Agus bha mi dèidheil air Ivor the Engine nuair a bha mi beag cuideachd! An t-seachdain sa chaidh, bha cothrom agam a dhol air loidhne a’ Chambrian mu dheireadh thall le mo chàirdean Rhisiart is Keith a tha a’ fuireach ann am Borth faisg air Aberystwyth. Bha againn ri trèana fhaighinn bho Bhorth gu Ceann-rèile Dyfi an toiseach gus trèana eile a ghlacadh gu Pwllheli. Nuair a ràinig sinn an stèisean, ge-tà, fhuair sinn a-mach gun robh an trèana againn air a cur dheth. Air an adhbhar seo, bha againn ri dhèanamh air stèisean Ceann-rèile Dyfi sa chàr aig peilear ar beatha oir cha robh ach mu 20 mionaid gus am falbhadh an trèana. Bha sinn gu math sgìth nuair a thàinig an trèana ach cha b’ fhada gus an do dhìochuimhnich sinn mu dheidhinn sin a chionn ’s gun robh na seallaidhean cho sònraichte. Tha loidhne Costa a’ Chambrian coltach ri Rathad-iarainn na Gàidhealtachd an Iar ann an iomadh dòigh. Tha i cliùiteach mar loidhne dhùthchail, breàgha, fhada an cois na mara agus tha an loidhne a’ sgàradh cuideachd leis na trèanaichean a’ dealachadh letheach slighe. Tachraidh seo anns a’ Chrìon-làraich ann an Alba agus ann am Machynlleth anns a’ Chuimrigh. ‘S e loidhne Aberystwyth loidhne an Òbain agus ’s e loidhne Pwllheli loidhne Mhalaig! Tha loidhne Costa a’ Chambrian gu math coltach ri Loidhne a’ Chinn a Tuath gu Inbhir Ùige is Inbhir Theòrsa cuideachd. Tha an loidhne ri taobh a’ chladaich airson tòrr den t-slighe agus ged a tha an talamh beanntach, tha na beanntan nas cruinne agus nas ìsle na an fheadhainn a chitheadh tu air taobh an iar na Gàidhealtachd. Gu dearbha, shaoileadh tu gur ann air loidhne a’ Chinn a Tuath a bha thu, mur a b’ e ’s gun robh a’ mhuir air an taobh cheàrr! Tha seallaidhean air leth den mhuir is den traigh agus de làraichean-eachdraidheil gu leòr, a’ gabhail a-steach Caisteal Harlech, Drochaid rèile ainmeil Abermaw (Barmouth) agus eile. Ma tha thu deidheil air an sreath TBh the Prisoner, chì thu Portmerion cuideachd. Tha rathaidean-iarainn glèidhte gu leòr ri taobh loidhne a’ Chambrian cuideachd – abair thusa gu bheil! Ann an Aberystwyth, tha an Vale of Rheidol. Faisg air Machynlleth tha Rathad-iarainn Corris. Air loidhne a’ chosta, thèid thu seachad air an Talyllyn, a’ chiad rathad-iarainn glèidhte ann am Breatainn. Faisg air Abermaw, chì thu rathad-iarainn beag an Fairbourne cuideachd. 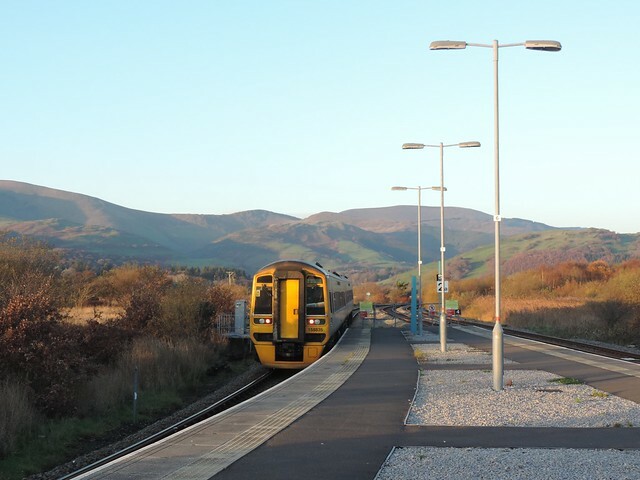 An uair sin, nuair a ruigeas tu Porthmadog, tha thu ann an neamh nan trainspotter! An seo, tha am Ffestiniog, an rathad-iarainn caol-ghèidse as ainmeile air an t-saoghal, agus cuideachd, an Welsh Highland Railway – Rheilffordd Eryri agus an Welsh Highland Heritage Railway – Rheilffordd Ucheldir Cymru. Abair deagh àite – trì rathaidean-iarainn glèidhte, stèisean air an lìonra nàiseanta AGUS Cuimris ann cuideachd! ‘S e turas caran fada a th’ ann gu Pwllheli agus gu h-annasach, nuair a ruigeas tu do cheann-ùidhe, tha an stèisean car coltach ri Stèisean Mhallaig! Gu mì-fhortanach, ge-tà, chan eil sgeul air an Eilean Sgitheanach! Bha tòrr sna meadhanan bho chionn goirid mu na taghaidhean meadhan-teirm anns na Stàitean bho chionn goirid. Coma leat na poileataigs, ge-tà – an robh fhios agad gu bheil rathad-iarainn fo-thalamh aig Capitol nan Stàitean Aonaichte ann an Washington? Chan eil mi idir a’ ciallachadh meatro Washington – subway mòr ceart le còrr is 90 stèiseanan agus an treas subway as motha sna Stàitean as dèidh New York is Chicago. ’S ann a tha mi a-mach air siostam subway beag bìodach a tha a’ ceangail Taigh nan Riochdairean agus an Seanadh agus na h-oifisean aca ri chèile. Chan e dìreach aon loidhne a th’ ann – tha trì loidhnichean le sia stèiseanan san t-siostam! Dh’fhosgail a’ chiad loidhne ann an 1909 ach an siostam air fàs bhon uair sin. Tha dràibhear air tè de na loidhnichean ach ‘s e trèanaichean fèin-obrachail a tha air na loidhnichean eile. A bheil thu ag iarraidh a dhol air? Faodaidh tu – cho fad ’s a thèid thu air turas oifigeil den Chapitol. ‘S iad an dà rud as fheàrr leam san t-saoghal rathaidean-iarainn agus roc cruaidh. Gach bliadhna bidh mi a’ dol air turas rèile gu àite ùr eadar an Nollaig agus a’ bhliadhna ùr agus am-bliadhna bidh mi a’ dol gu cathair-bhaile ann an Siorrachd York aig a bheil cliù airson an dà chuid ceòl agus rathaidean-iarainn – Sheffield. ‘S ann à Sheffield a tha Def Leppard, còmhlan a bha na phàirt den New Wave of British Heavy Metal aig deireadh nan 70an agus an uair sin a dh’fhàs ainmeil airson roc cruaidh nas popaich, gu sònraichte ann an Ameireagaidh. Bha cluicheadair giòtair sònraichte math aca – Steve Clark. Bha e fìor mhath air a’ ghiotàir is bha coltas gu math cool air cuideachd. Bha postair dheth agam air mo bhalla aig an taigh nuair a bha mi nam dheugaire. Gu mì-fhortanach, bha droch thrioblaidean dibhe aig Steve agus chaochail e mar thoradh air seo aig aois fada ro òg ann an 1991. Tha Steve air a thiodhlacadh ann an Sheffield agus tha mi a’ dol a thadhal air an uaigh aige nuair a bhios mi ann. Fhad ’s a bhios mi ann, agus fhad ’s a tha mi ag èisteachd ri Def Leppard (gu sònraichte On Through the Night, High N’ Dry agus Pyromania nuair a bha iad fhathast ri meatailt cheart!) bidh mi a’ dol air seirbheis rèile gu math ùr is gu math eadar-dhealaichte. Chan e trama a th’ ann agus chan e trèana a th’ ann – ’s e a th’ ann ach trama-trèana – measachadh den dà chuid. Tha iad gu math subailte oir faodaidh iad ruith air an rathad-iarainn àbhaisteach agus air slighe-trama cuideachd, a’ gabhail a-steach a bhith a’ ruith air an t-sràid. Tha siostam thramaichean ann an Sheffield mar-thà agus chaidh na trama-trèanaichean a thoirt a-steach airson ruith gu Rotherham, baile mòr faisg air làimh, air an lìonra-rèile nàiseanta agus air adhart gu stèisean ùr Rotherham Parkway. Tha seo uamhasach math ach chan e gnothach furasta a th’ ann idir. Tha rathaidean-iarainn is slighean-trama gu math eadar-dhealaichte ged a ruitheas an dà chuid air rèilean. Airson a dhol air an rathad-iarainn mhòr, feumaidh na trama-trèanaichean a bhith gu math làidir is luath. Bidh iad air a’ mhòr-loidhne far am bi trèanaichean àbhaisteach ann a tha gu math trom agus gu math luath agus mar sin, feumaidh iad a bhith gu math “crashworthy” air eagal ’s gum buail iad ann an trèana guail! Aig an aon àm, chan urrainn dhaibh a bhith ro mhòr is ro throm a chionn ’s gum bi iad a’ ruith air an rathad cuideachd far am bi daoine is càraichean is luchd-baidhseagail ann. A bharrachd air seo, tha slighean-trama gu tric gu math cas is gu math lùbach – rud nach eil idir freagarrach airson trèanaichean àbhaisteach. ‘S e deuchainn a tha seo agus ma bhios e soirbheachail, dh’fhaodte gun tèid a chleachdadh ann am bailtean eile. Thathar a’ beachdachadh air an teicneòlas seo airson Port Adhair Ghlaschu, mar eisimpleir, leis na trama-trèanaichean a’ ruith eadar Glaschu Mheadhain agus Pàislig air an lìonra-rèile nàiseanta agus an uair sin, a’ ruith air an t-sràid bho Phàislig dhan phort-adhair. Mar sin, cò aig a tha fios nach fhaic sinn na trama-trèanaichean ann an Alba fhathast. Bha mi aig Rathad-iarainn Bo’ness is Cheann an Fhail an latha roimhe. Mar as trice, ’s e seann thrèanaichean glèidhte a chì thu an sin ach an t-seachdain seo, bha iad a’ dèanamh deuchainn air trèana a tha gu tur ùr – an D-tràin. 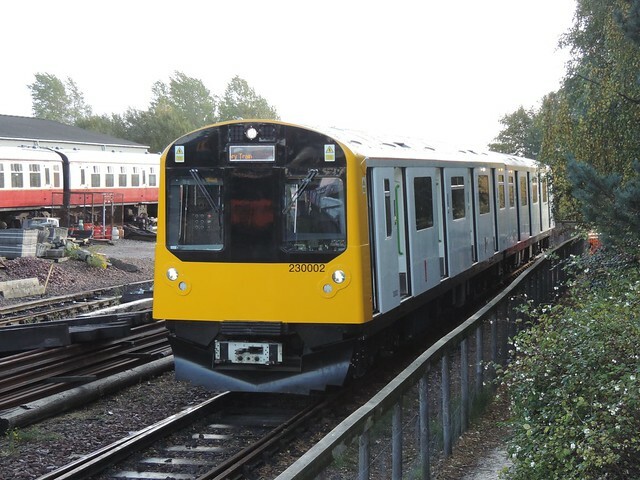 Mar a dh’aithris mi an seo bho chionn ghoirid, tha a’ chompanaidh Vivarail air na ceudan de sheann thrèanaichean D-stock bhon District Line aig Underground Lunnainn a cheannach agus tha iad gan ‘suas-chuairteachadh’ gus trèanaichean ùra a chruthachadh air a bheil an D-train. 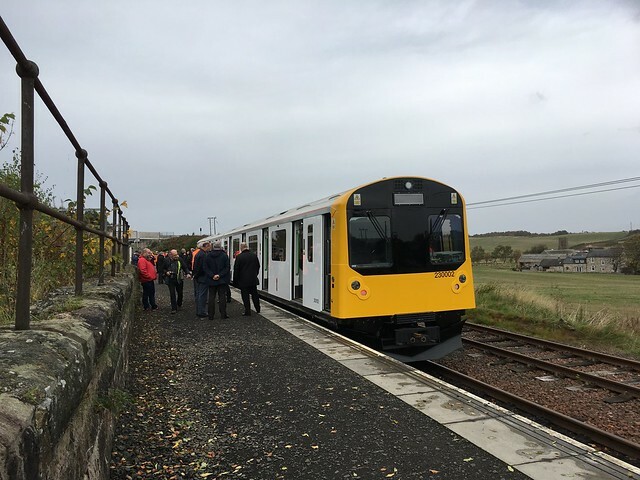 Tha trèanaichean ùra gu math daor aig an àm seo agus chaidh an D-train a chruthachadh airson a bhith nas saoire agus nas uaine na na trèanaichean eile. Tha iad rim faighinn ann an cruth dìosal-dealanach, bataraidh-dealanach no hybrid. Tha a’ chompanaidh air òrdughan fhaighinn airson feadhainn dìosal-dealanach airson na Cuimrigh (loidhne Wrecsam-Bidston agus Loidhne Gleann Conwy) agus airson Sasainn (Bedford-Bletchley) agus tha iad a-nis a’ feuchainn ri cuid aca a reic ann an Alba. Tha an trèana bataraidh-dealanach fìor chudromach. Tha e gu math daor rathaidean-iarainn a dhealanachadh le uèirichean dealanach agus airson cuid de loidhnichean, bidh greis ann mus tèid uèirichean a chur suas. Le cuid eile, chan eil e coltach gum bi an t-airgead ann gus uèirichean a chur suas gu bràth. Aig an aon àm, tha e a’ sìor-fhàs nas cudromaiche a bhith a’ lùghdachadh an uiread de charbon a tha còmhdhail a’ sgaoileadh is mar sin, tha feum againn air barrachd thrèanaichean dealanach cho luath sa ghabhas. A-nis, tha e coltach gu bheil na bataraidhean air tighinn gu ìre. Chan eil iad feumach air ùine teairrdsidh ro fhada agus ruithidh iad suas ri 40 mìle eadar teairrdsean. Ann an Alba bhiodh iad air leth feumail airson loidhnichean ann am mòr-sgìre Ghlaschu nach eil air an dealanachadh fhathast – Loidhne Cnoc a’ Bharra (Barrheid), Loidhne Chille Brìghde an Ear agus gu sònraichte Loidhne Cnoc Màiri. 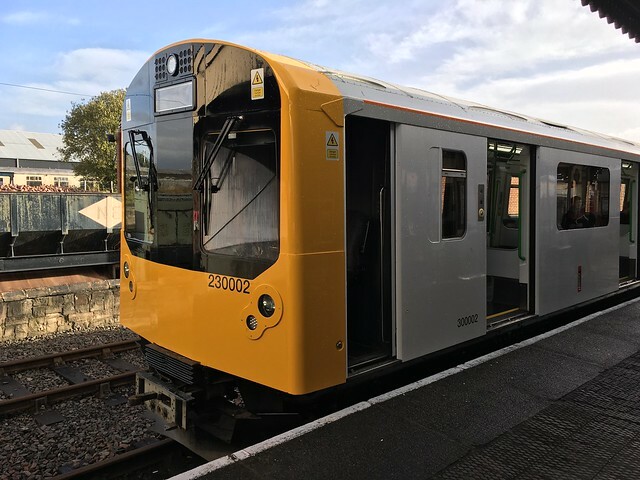 Tha Cairdean na Loidhne a Tuath a’ bruidhinn air D-train fhaighinn airson loidhne a’ chinn a tuath gus seirbheis ionadail a chur air dòigh eadar Inbhir Theòrsa agus Inbhir Ùige. 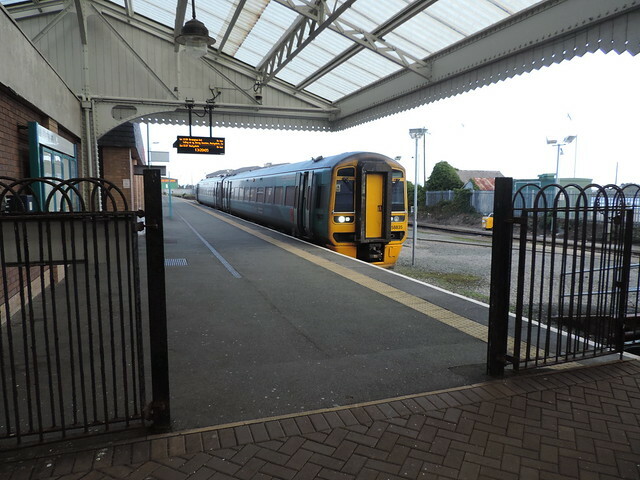 Agus tha am Pàrtaidh Uaine air a bhith a’ beachdachadh air na D-trains a chleachdadh mar phàirt de sgeama gus stèiseanan agus rathaidean-iarainn ath-fhosgladh mar ‘pop-ups’ – bhiodh na trèanaichean seo air an cleachdadh le àrd-ùrlaran aotrom sìmplidh gus faighinn a-mach a bheil iarrtas ann air seirbheisean fad an t-siubhail. Thathar a’ moladh seo airson loidhne Allmhaigh-Ceann Chàrdainn-Dùn Phàrlain. Tha seo uile glè mhath – ach cò ris a tha an trèana fhèin coltach? A bheil e sàmhach gu leòr, luath gu leòr, cofhurtail gu leòr? Chaidh mi gu Bo’ness gus faighinn a-mach. Bha an D-train ann gus tursan saor is an-asgaidh a thoirt dhan phoball agus gu riochdairean bho chompanaidhean rèile Diciadain, Diardaoin is Dihaoine an t-seachdain seo. Bha fèill mhòr air na seirbheisean agus bha an trèana air an robh mi Dihaoine gu math làn. Tha loidhne Bo’ness gu math cas ach cha robh e idir doirbh dhan D-train sreap suas bho Bho’ness gu Manuel aig ceann na loidhne. Bha an trèana gu math sàmhach agus bha i math air luathachadh (acceleration) cuideachd. A rèir coltais, chòrd an turas ris a h-uile duine air an trèana agus tha a’ chompanaidh Vivarail toilichte le mar a chaidh an deuchainn. Tha mi an dòchas gum faic sinn tòrr a bharrachd den d-train ann an Alba gus seirbheis rèile nas fheàrr is nas uaine a thoirt dhuinn.